See that gif? Yea, that big one of the clapping hands? That just about sums up every single thing I could possibly say about this book. But, because I’m not awful – even though I want to be – stay tuned for an actual review after some serious fangirling. BEAUTIFUL. GORGEOUS. ALLURING. DAZZLING. FASCINATING. MARVELOUS. SPLENDID. STUNNING. SUPERB. WONDERFUL. ENTICING. ELEGANT. RADIANT. REFINED. SUBLIME. MAGNIFICENT. DELIGHTFUL. BEWITCHING. TA DA! 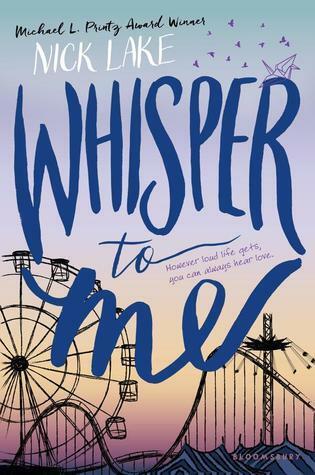 Whisper to Me has given me all the feels and I don’t know what to do with myself right now besides throw as many adjectives at you as I possibly can. This book is heart-wrenching, the characters fantastic, believable, and so relatable it was like looking at myself in a mirror. Just… ugh. GUYS! This book is more than just a book. It is an important and poignant take one something a lot of people cringe at the thought of: mental illness. Mental Illness is scary, sure, but it isn’t this horrific Voldemort-like-entity that should not be named. There are so many people who struggle with Mental Illnesses, varying from anxiety to schizophrenia, and seeing it portrayed in a realistic way rather than covered up and sugar coated is something the YA book world lacks. It’s either used as a plot device, AKA Manic Pixie Dream Girl’s like Vivi from When We Collided, or it is used in such a minimalist way it barely leaves any impact and it might as well be nonexistent (If you guys have any recommendations on the flip side, please share). The struggle that characters go through, these types in particular, should be used to show that people out there are not alone – that it isn’t something to be ashamed of or embarrassed about. Whisper to Me does just that. I can’t and don’t want to spoil the story for you, which would be inevitable if I decided to tell you more about this. But, I can say this, be patient. This book isn’t the “grab you by the throat and throw you around until you scream for mercy” sort of book, it is a gentle ebb and flow of complicated plot lines and even more complex characters that you have to stick around till the end for because it is so, so worth it. It is beautiful and it brought tears to my eyes on more than one occasion. A personal letter detailing the harrowing journey of a girl trying to desperately reclaim her life, Whisper to Me is anything but typical and, personally, one of my new all time favorite books. It is inspiring, heart-warming, gut-wrenching, relatable, and everything you can want in a contemporary. This is more than just another one of “those young adult books”, this is more than just a story to read when you’re bored or to put you to sleep – this is a masterpiece and I am so grateful to have been able to read it. Sam mental illness is a subject near and dear to my heart, and to see you praise it for it authenticity and beauty is something I can’t ignore. Thank you!